Jack Phillips, the Colorado baker whose “Masterpiece Cakeshop” was subject of this year’s 7-to-2 U.S. Supreme Court victory supporting his religious freedom, stopped by Salem/Los Angeles to help generate support for his Alliance Defending Freedom legal team. ADF has filed a new lawsuit against Colorado’s Civil Rights Commission to stop persecution of Phillips…after the state filed another case against him for declining to create a cake for a transgender customer. 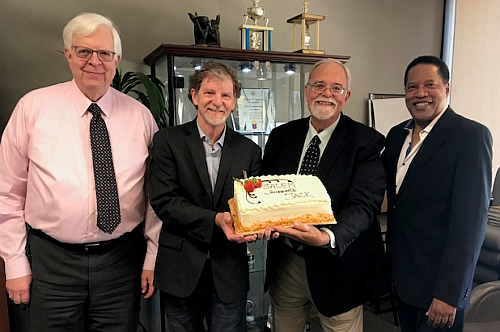 Pictured enjoying a celebratory cake are (L-R) Salem Radio Network talk host Dennis Pager; Phillips; SRN VP/News & Talk programming Tom Tradup; and SRN talk host Larry Elder.